Surrounded by the sheltered waters of Malaysia’s Malacca Straits, AVANI Sepang GoldCoast Resort offers a secluded tropical hideaway that blends easy accessibility with a feeling of getting away from it all. 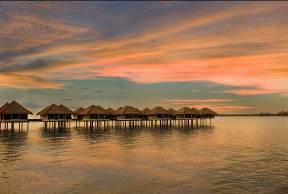 Set along Sepang GoldCoast’s 22 kilometre shore, the resort has a mainland beachfront setting with lush gardens and a palm structure built on stilts which extends over warm shallow waters. The overwater palm features 392 contemporary Polynesian-inspired guest rooms and one, two and three bedroom villas, all with a sea view. 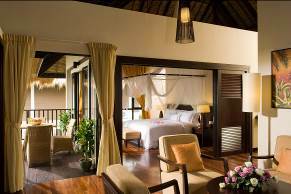 Guests staying in a Three Bedroom Villa also experience first class butler service including welcome drinks and a special check-in service, before being taken to their villa by private buggy. So that all guests can enhance their resort experience, this exclusive butler service can be booked for all accommodation types. The resort has an impressive selection of dining options for guests to enjoy. The five restaurants include Sepoi Sepoi which entices guests with a café ambience and a Malaysia-Chinese coffee shop menu of freshly brewed coffee, casual lunches, afternoon snacks and laid back dinners. Two restaurants are located in the central area of the palm and have both been fully refurbished. Aptly translating as “anytime”, Bila Bila’s all day international buffet and a la carte offerings can be enjoyed in air conditioned indoor comfort or on an outdoor deck with a sea breeze, whilst Hai Sang Lou is the resort’s Chinese fine dining specialty restaurant serving both lunch and dinner. The beachfront restaurant Perahu boasts a superb sundowner experience from the deck and imaginative local and global flavours, including Malay barbeque delights, with the mood picking up at night when a live band hits the stage. Offering another great sunset spot and evening dining, Stimbot impresses with artfully prepared oriental specialties. For poolside refreshments, the refurbished Buloh Bar offers extensive beverages and light bites and after sundown kicks up a notch with live entertainment. Selat Bar on Sunset Beach serves tropical drinks with waves breaking just a few steps away and offers karaoke, billiards and pool. In addition, an ideal meeting place is Bayu Lounge, a contemporary lobby venue which has been completely refreshed with a touch of Malaysian design and serves snacks, pastries, cakes and desserts.